The purpose of the Service Level Management process is to ensure that all current and planned IT services are delivered to agreed achievable targets. This is accomplished through a constant cycle of negotiating, agreeing, monitoring, reporting on and reviewing IT service targets and achievements, and through instigation of actions to correct or improve the level of service delivered. 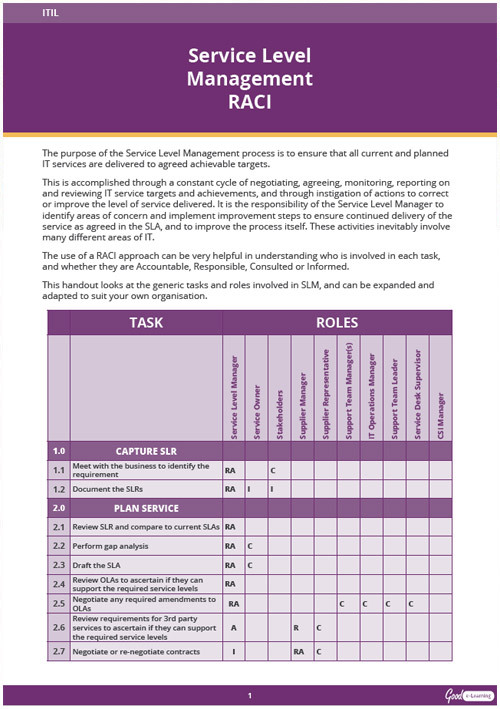 It is the responsibility of the Service Level Manager to identify areas of concern and implement improvement steps to ensure continued delivery of the service as agreed in the SLA, and to improve the process itself. These activities inevitably involve many different areas of IT. This ITIL template looks at the generic tasks and roles involved in SLM, and can be expanded and adapted to suit your own organization. Download your copy of this ITIL template today and you’ll also get instant access to 480+ business & IT learning resources!